One of the best things about life on the road is the people we meet. So many nice and interesting people it would be impossible to tell you about all of them. But the people of Alabama deserve a special mention. There must be a special kind and generous gene that is reserved just for them. When we were staying at Adelaide Shores in Avon Park last December/January we met Jim and Judy Maddox of the Meandering Maddoxs. 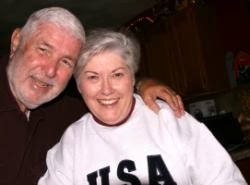 They sold their home (and this year their cottage on a lake in Alabama) and are now full time RVers. In the summer they work part time as campground hosts at Blanton Creek Campground in Alabama and in the early spring, late fall they travel around exploring the country with a long stay at Avon Park during the winter. 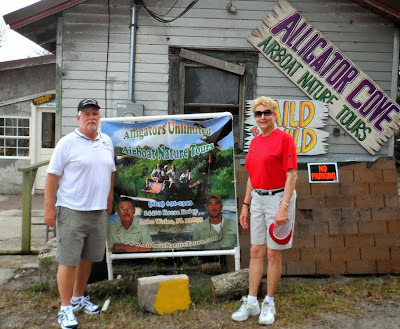 Jim and Judy joined us on a nature tour of the swamps around Lake Kissimmee FL. When we owned Bay Hammocks we welcomed Rvers to stay on our property through the Boondockers Welcome website. That is how we met Mike and Pat. Lovely people who invited us to visit with them at their home in Alabama. We really wanted to do this on our way south this year but our route took us just a bit to far west to do so. Perhaps next year, we will make a detour to visit on our way to (or from) Florida. But we did spend time in the western corner of Alabama this year. Having repairs done to the Adventure Bus. The story of these repairs is rather long. On our way home last spring we stopped at a truck tire shop in Maine to add air to our tires. (Regular gas station air hoses do not have enough pressure for this job.) The man who owned the shop told Arch that we needed a front end alignment, which we decided to have done when we got home to Nova Scotia. Then, when we got home we parked at Bay Hammocks for 4 months without moving the Adventure Bus. In early August we started to prepare the Adventure Bus to travel this winter. First project – the front end alignment, which Arch hoped would eliminate a shake that had developed in the front end. No such luck. So then the repair people removed the drive shaft to see if it was causing the problem because there was a problem with the universal joints or it was out of balance. This was all fine. Next was two trips to a truck tire shop to have the tires balanced. The front end still shook when we drove over 50 mph. And we were beginning to realize that the real problem was that repair shops in Nova Scotia are not familiar with motorhomes (Most Nova Scotians buy 5th wheels or trailers). So, since it was not a safety problem, we decided to wait until we got to the US. Our first opportunity to stop at a RV repair facility was in Greencastle, PA. We arrived at the shop only to learn that they did not do tires. But they suggested we go to the Freightliner facility about a mile up the road. Freightliner did not do repairs at that facility but sent us on up the road to another facility where they did repairs. When we arrived there the man at reception they could fix it but there was a 2 hour wait to get into the shop. Well, we had already waited for 3 months so two hours was fine. So we took a number -really- and waited – 4 hours. And when the person from the repair shop heard what the problem was he said “we don't fix that”. So we left. And about a half hour down the road we encountered a traffic jam. Interstate 81 was closed in both directions due to a truck accident and traffic was being rerouted through the town of Harrisionburg VA. That took 4 hours. That was not a good day! So we took a few days off from trying to get the problem fixed and enjoyed out time on the Blue Ridge Parkway and in Nashville. We left Nashville and travelled down the Natchez Trace to Florence. Alabama where we found a beautiful little campground in a city park. The perfect spot to stay and try and get the front end fixed. We asked our fellow RVers where to go. 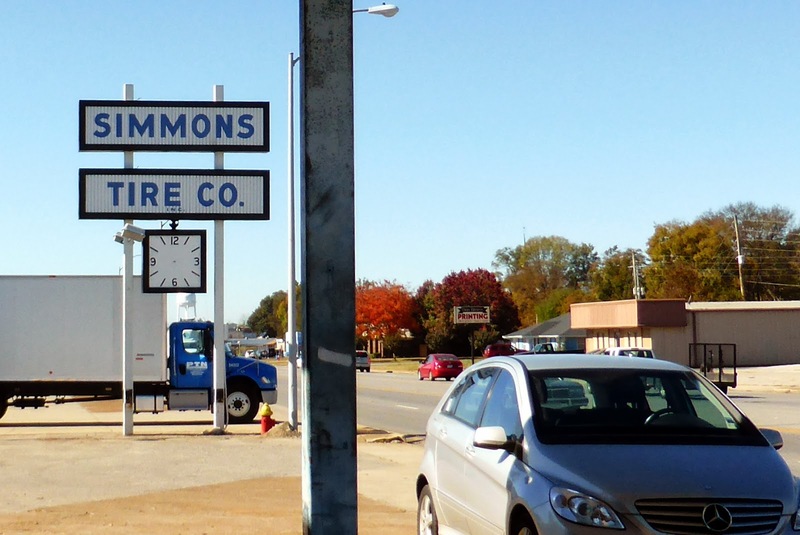 They recommended The Simmons Tire Company. We called and they said “come on over, we will take you in immediately”. So off we went. They quickly took the Adventure Bus in to the shop and put it on a special tire balancer (my technical description) for trucks and within 5 minutes came back and said we can fix this, no problem. Both front rims are slightly bent (and they just happened to have a pair on motorhome tire rims that were the right size) and the tires are out of “true" i.e. Not round. They fixed it in about an hour. Again, really nice, honest Alabamans. While all this was going on our furnace was starting to make a loud screeching noise and as the nights were cold we wanted to use it. So this had to be fixed. We decided to push our luck and asked at the RV park where we should go. They recommended Kinny's RV Center in Red Bay, Alabama. So we headed there the next morning. No appointment but they took us right in. Again really nice, helpful people took care of us. We were able to wait in the Adventure Bus with supplied electricity. Four hours later we had a new motor and fan in the furnace – and it ran quiet as can be. We really lucked out here as our furnace is obsolete, but Red Bay is the home of Tiffin RV who manufacture several models of RVs and just happened to have an old furnace on hand that was used for parts. Arch suggested they install the complete furnace but it was too large. So after all the pain the Adventure Bus is working perfectly, thanks to the good people of Alabama. And we are on our way. Red bay is a good place to get coach work done. And good that you were able to get tour furnace fixed in a timely manner.